If you are wanting to garden this year but don’t think you can afford the start up costs, think again! Planting your own backyard garden or even just adding to the landscape of your home does not need to be stressful or pricey. In fact, if you follow just a few simple tips and tricks, you can grow a beautiful garden and add some color to your yard on a dime! Don’t worry, I won’t suggest you pick your neighbors plants either! There are actually some very simple ways to get the yard you want without blowing your budget. 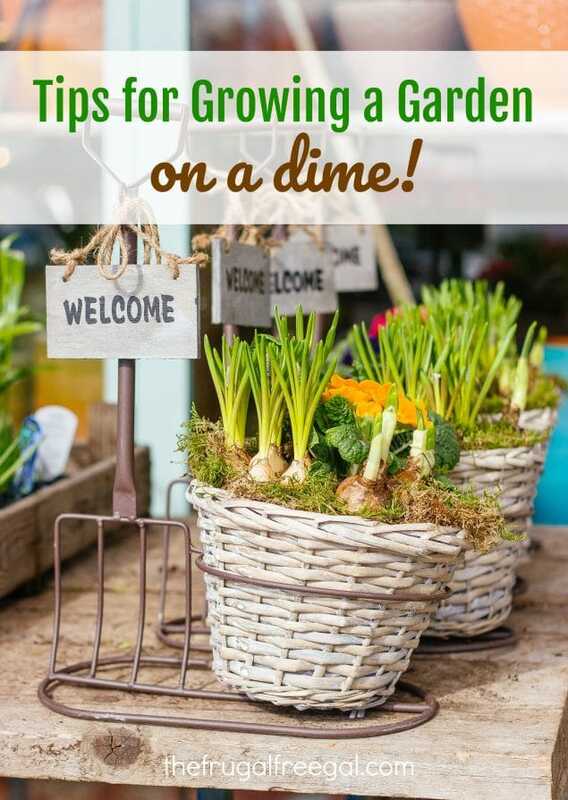 Below, you will find some great tips for growing a garden on a dime! Take a look at how easy it is to get a colorful yard for pennies. You may have a greener thumb, and wallet by doing so! Many gardeners need to thin out their plants in the spring, and hate to toss what is still good. Keep an eye on Craigslist to find gardeners giving away free plants. Many are happy to give starts away for free as long as you come and pick them up. This is a great way to score free plants. Local libraries may often free gardening clubs and plant swaps. Be sure to call yours and see if they are offering any this season. This is a great way to not only get some free info, but score some free plants and other gardening supplies. Don’t toss those produce and veggie seeds, save them! You can even swap seeds with friends so you can all have a variety. You may need to store different varieties of seeds in a special way, so do your research first so you’ll know how to store them properly. Maybe your elderly neighbor has a beautiful lily patch but can’t thin them out each season. Offer to do it for her in exchange for keeping the starts you pull. When lilies cost $3.00 a plant at your local gardening center, this can really add up to be a great deal for you! Many home improvement stores offer free workshops for kids where a make and take activity is done. Check out your local stores and see if there are any available this spring. Your child might get a free seedling, tree, or birdhouse to accent the yard. Don’t pay big bucks for expensive borders and yard decor. Instead, look for free river rock, old brick, discarded wood, etc. that you can use for your borders. Place old colorful dishes or shabby old painted furniture in the yard for some cottage decor. Add a little paint to spruce up what you already have! As you can see, there are so many great ways to get plants and supplement your lawn and garden for little to nothing. You just have to be creative and think outside of the box. When you do, you will see how easy it is to develop your yard and keep money in your pocket at the same time. Happy gardening! Actually, you don’t just save your seeds – there is a process that needs to be adhered to – for instance, you have to gently ferment tomato seeds before drying. Also, only heirloom seeds should be saved – if you save hybrid strains, you are unlikely to get the same type of plant that it originally came from. The Craigslist and Home Depot tips are great though! Thank you for your tips. I updated the post to include doing research before saving and storing the seeds, depending on the variety.